For over 35 Years, we at Lamp Doctor have been performing expert restorations on all types of lighting fixtures. From antique brass and bronze lamps and vintage chandeliers to sconces and lampshades, we are the one place for all your antique lighting needs. 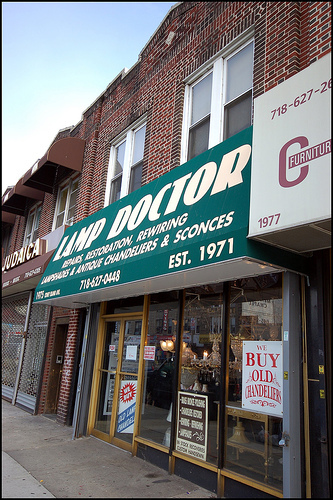 Lamp Doctor is where we painstakingly rewire, repair, refinish, polish, and restore all your lamps and lighting fixtures. 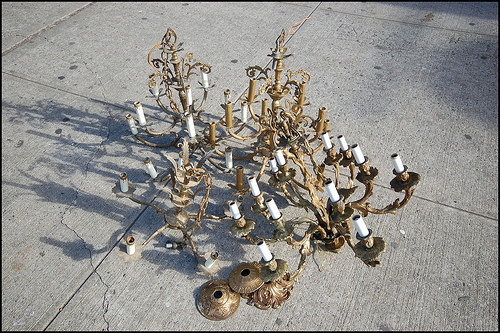 Our expert team of refinishers, technicians, polishers, and repairmen can take even the most tired old vintage lamp or antique lighting fixture and bring it back to its former lighting glory. We offer a complete line of services in lamp rewiring, refinishing, polishing, repair of broken parts, and complete lighting restoration. Replacing old silk wiring in antique fixtures is a specialty at the Lamp Doctor, and a safety must. Bronze and Brass chandeliers and lamps are disassembled, and depending on the finish required, either rejuvenated or expertly polished and lacquered to preserve the finish. Wiring is replaced wherever it has disintegrated. The Lamp Doctor is uniquely equipped to handle even the toughest lamp and lighting fixture rewiring jobs. Your beautiful lighting fixture is skillfully evaluated and restored to the correct finish based on our 35 years of experience in the restoration business. The Lamp Doctor is listed in the New York City Landmarks Conservancy Guide for landmark lighting restoration and we have restored and rewired chandeliers and sconces in numerous New York City land marked buildings. For chandeliers, lamps, or sconces that have a painted finish, we can strip and repaint the fixture to its original finish, or you can choose one of our hand applied painted finishes and change the look completely. 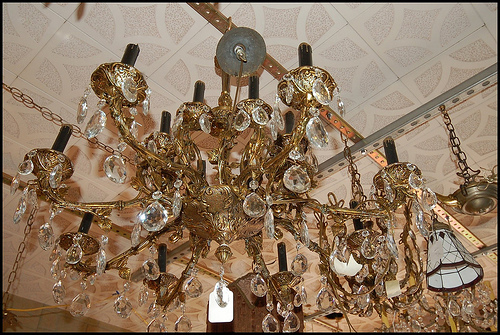 Vintage and antique crystal chandeliers truly benefit from the cleaning and restoration process. We fully disassemble the chandeliers and clean all the crystal parts inside and out. The chandelier is fully rewired, reassembled and redressed with the original crystals (or we can add crystals and redesign for a customized look). At Lamp Doctor we also restore fine old antique and vintage hardware including: doorknobs, window pulls, and fireplace andirons. Your original hardware will look beautiful when reinstalled in your home. Click Here to see before and after pictures of some of the items we restored. Over the past year, we've collected a few light fixtures from various sources. With few exceptions, they needed some kind of repair/rewire/fix or another. We had one large chandelier rewired by a friend but he has a life too and after realizing how much work is involved, we didn't dare ask him for more help. But we still had a box of light fixtures that needed to get fixed before they were installed. Thanks to a recommendation on the forum, we found Lamp Doctor. Its run by a sweet couple and small staff who really know what they are doing and are clearly still on their even after so many years in the business. It’s the kind of shop that makes me so happy to live in Brooklyn. I wouldn't say their prices are cheap but their turnaround is quick and they don't try to get you to pay for services you don't need. Last week we dropped off a pair of old sconces we picked up on vacation and a light fixture we bought during our	salvage tour of New England. When we picked those up, we went to drop off the chandeliers we had for a polishing/rewiring/socket repair. We ended up selling one of these to them and bought a more elaborate chandelier for our living room. Im hopeful it will add some sparkle to the room. Definitely check them out if you need any repair work or have old chandeliers to sell. I'll post photos of these when they are finally installed. Its looking closer and closer to that time everyday but we're still a little way off from these finishing touches going in. I used them to rewire and refurbish my dining room chandelier (which looks quite similar to one you bought from them). As you say, they are not cheap. But they did an awesome job.